got the grill off, i can't get the 2 clips/ off the emblem on the back of the grill ? Are they like these ? Last edited by kdizz; 04-26-2017 at 06:35 PM. You have to get your self a pick like tool (like a dental tool) or a very small screw driver _ something that's made of good steel that can fit between and underneath the tabs. With that tool start carefully prying up the tabs _ a little at a time working your way around in a circle until the tabs are no longer "bighting" into the emblem's plastic posts. The thing isn't really meant to be removed, so sometimes they break, you can very get them at any auto parts store. If it doesn't break you can carefully take small hammer and tap the tabs back down into their original position so it will work again. It cab be reused a few times this way, but eventually the spring steel that the locking ring is made out of will break. 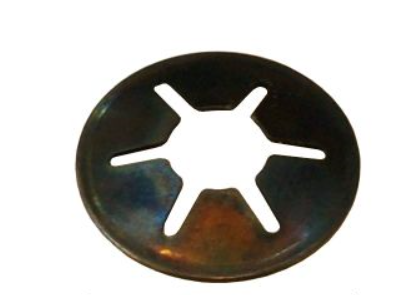 Try "star lock" push on fastener. ahh sweet thank you, now the tricky part is removing the emblem, ! it looks like there is no adheasive or tape/glue on the stock emblem, but its really in there ! It should just fall out with very slight pressure. Unless Ford also used some of that acrylic adhesive tape as well. That stuff is also used to hold door molding on and doesn't like to come off. Push on the emblem from the back with even pressure on both studs, but not so much that you will break the emblem. The acrylic adhesive will eventually give under the pressure, but it may take a minute. Heating up the emblem from the out side with a hair drier sometimes will soften the adhesive enough to make it "give" a bit easier. I think Ford expects you to buy an entire new grill or emblem. i snapped off the two outer studs on the old emblem and it pushed rite out.... this is after the fact i tried to pry 2 screw drivers under the emblem and lift it, in doing so i scuffed one corner just outside the emblem =[ dammit ! You can pick up a roll of that acrylic tape I was talking about and use that re-stick it again. Use a bit of alcohol to thoroughly clean the surfaces. Don't take offence of this, but you come across as being a bull in china chop with fussy things like this. i cleaned it very good, dried it. got the emblem on there nicely, i even went to the autopart store and found some new "star lock' automotive fasteners !! thanks for the help JEFF R , and i am a bit ruff , when doing things like this. your rite i need to have more patience. thanks again jeff r, im sure the tailgate emblem will be a lot more difficult, i have a paint scraper, some fresh razor blades, not sure how to attack it yet. There is an access panel on the tail gate, remove that and make sure there isn't any more "star" washers involved. 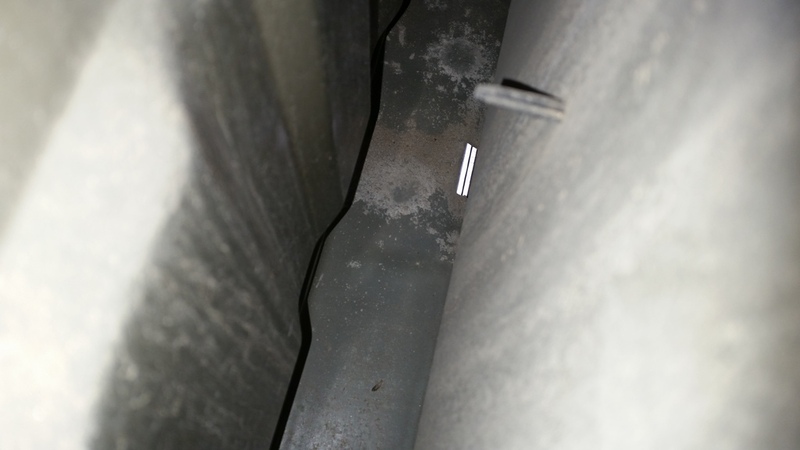 You may want to put some penetrating oil on the bolts holding the access panel in place and leave it over night. With out checking, the heads may "Philips" and you know what a 'bear" they can be, especially if they're a little rusty. If the emblem is stuck on with tape as well, use heavy duty masking tape to protect the paint, but not too much. Get the tape "tucked" in as close as possible to the emblem. Get a putty knife, the kind with the thin tapered blade. Put that hard up against the tailgate emblem at one end (not in the middle). The first putter knife is to further to protect the paint. Get another putty knife and grind it thin on the end. (make sure it's quite sharp and there are no burs on it) Grind it so just the top part is sharp, you don't want it double edged like a knife. Keep the flat side down against the other putty knife. Start using the second putty knife and slowly work you way around to release the adhesive, all the while, while using the first putty knife to protect the paint. 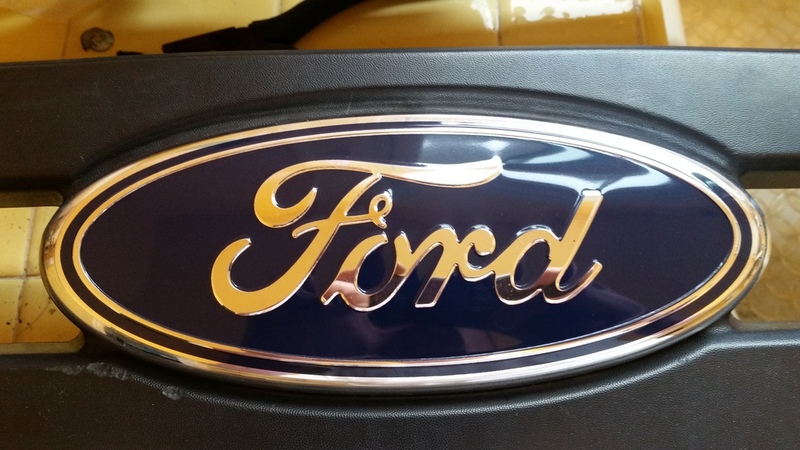 I do know for a fact that there are two prongs on the rear emblem, when shopping for a new tail gate, you can see where Ford has pre-drilled the holes. What's on the prongs I don't know, but probably more star lock washers. The adhesive has to be "cut", it won't release just by pulling on the emblem. Best case scenario is that there will be no adhesive. I replaced my giille emblem right after i bought it.They are a bit tricky.I used needle nose pliers and teeny flat screw driver.Was able to use the little flat nuts? again. Plenty of lacquer thinner to get the goo off the old emblem. I'm getting ready to replace my tailgate emblem,got it off E-bay,30 bucks. If you take your time they're not that difficult. i have a bed liner cover on the inside part of the tail gate, will i need to remove that to access any hardware from the inside ? or simply work from the outside of the tail gate and pry it off ? thanks for the lacquer thinner tip, will get some for sure . Jeff R 1 said there is star lock bolts holding the emblem on. ? I had a look at eBay, some have studs to take the star lock washers, some just have small alignment pins _ those ones are probably held on with just acrylic adhesive. I also looked at our Ford cube delivery van on the hood, it's actually held on by a couple of small nuts. If you start prying it off and there is something on the inside holding it on, you will definitely damage something. I have a new emblem for my tailgate,but I haven't tackled that yet. holding it on.No worry,just take your time,and get the lacquer thinner out. Don't hold me to this,as mines waiting for my new one. Let me know if you do yours first.